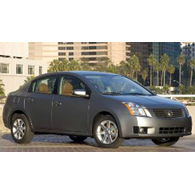 (autoinsidernews) - Nissan announced pricing for its all-new 2007 Sentra, which will start at $14,750 (not including a $605 shipping charge). All Sentra models are powered by a 2.0L four-cylinder engine that delivers 140-hp. The base Sentra is mated to a 6-speed manual transmission, reports Trend. All Sentras feature an array of available comfort and convenience features, including a 60/40 split fold flat rear seats that folds completely flat; the Divide-N-Hide Trunk System, which creates a hidden trunk storage compartment; and an integrated overhead compact disc holder that holds up to eight CDs. The new Sentra also includes standard air conditioning, power door locks and windows, and six standard air bags. Four other models are available including the Sentra 2.0 with CVT ($15,550), Sentra 2.0S with 6-speed manual ($15,650), Sentra 2.0S with CVT ($16,450) and Sentra 2.0SL with CVT ($18,400). While the 140-hp 2.0L four is the only engine available today, Nissan performance enthusiasts can hold out for the return of the Sentra SE-R. The 2007 Sentra is now on sale.